When you are choosing between luxury hotels in Downtown Pittsburgh, the Renaissance Pittsburgh hotel will surely be at the top of your list. 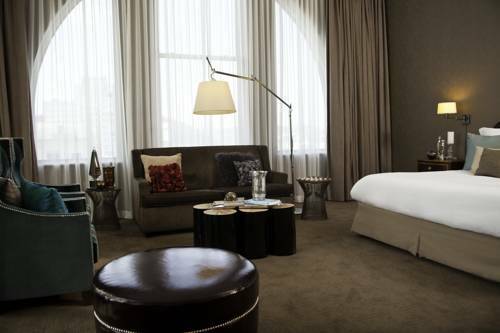 Housed in the iconic Fulton Building, this luxury hotel delivers contemporary style within an exceptional atmosphere. Our hotel is conveniently located in the Cultural District, home to the Benedum Center, Heinz Hall, and the August Wilson Center. While we're located minutes from most attractions in the Cultural District, we're only steps away from Heinz Hall. We are also close to the David L. Lawrence Convention Center, the celebrated PNC Park, and Heinz Field. Whether attending a game or a special concert, we're the perfect hotel to stay near PNC Park. Our riverfront location is only steps away from PNC Park! Two exceptional on-site restaurants, Braddocks American Brasserie and Braddocks Side Street, serve unique dishes and cocktails in a classic yet trendy environment.